2018: Mechanic / Neutral Support for the Elite National Track Championships at the LA Velodrome in LA, CA. 2017: Mechanic / Neutral Support at the Elite & Junior National Track Championships at the LA Velodrome, CA. 2016: Mechanic for the Team USA for all the Pre-Rio Olympics training camps. 2014: Mechanic / Neutral Support for the US Paralympic National Track Championships at the LA Velodrome, CA. 2013: Mechanic for the US Paralympic National Track Championships at the LA Velodrome, CA. 2013: Mechanic / Neutral Support for the Elite National Track Championships at the LA Velodrome in LA, CA. 2012: Mechanic / Neutral Support for the Elite National Track Championships at the LA Velodrome in LA, CA. 2009: Mechanic / Neutral Support for the Junior National Track Championships at the LA Velodrome, CA. 2008: Mechanic / Neutral Support for the Junior National Track Championships at the ADT Velodrome in LA, CA. 2008: Mechanic for the US Olympic Trials Track Cycling Team at the ADT Velodrome in LA, CA. 2008: Mechanic for the SBW Pro Women's Cycling Team at the World Cup Classic in LA, CA. 2007: Mechanic for the US Cycling Team at the Elite National Track Championships at the ADT Velodrome in LA, CA. 2007: Sr. Adviser / Mechanic for the USA Cycling Team at the World Cup Classic in LA, CA. 2006: Mechanic for the Spike Pro Cycling Team at the Elite National Track Championships at the ADT Velodrome in LA, CA. 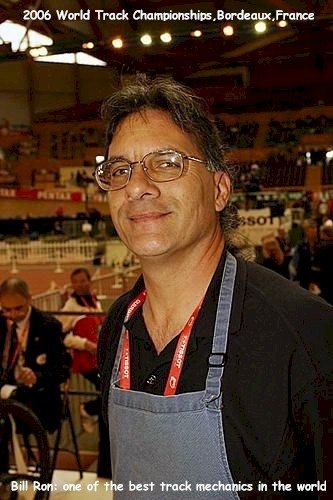 2006: Sr. Adviser / Mechanic for the USA Cycling Team at the World Track Championships in Bordeaux, France. 2006: Sr. Adviser / Mechanic for the USA Cycling Team at the World Cup Classic in LA, CA. 2005: Mechanic at the Elite National Track Championships at the ADT Velodrome in LA, CA. 2005: Mechanic at the World Track Championships at the ADT Velodrome in Los Angeles, CA. 2004: Mechanic at the World Cup Classic at the ADT Velodrome in Los Angeles, CA. 2004: Mechanic for the US Cycling Team at the Junior World Track Championships at the ADT Velodrome in Los Angeles, CA. 2004: Mechanic / Neutral Support for the Junior National Track Championships at the ADT Velodrome in LA,CA. 1991: Mechanic / Neutral Support for the Olympic Festival at the 7-11 Velodrome in Los Angeles, CA. 1986: Mechanic for several International Riders at the World Championships held in Colorado Springs, Colorado. 1984: Mechanic with the Campagnolo Technical Support Team for the 23rd Olympics for the track events, held at the 7-11 CSUDH Velodrome in Los Angeles, CA. 1983: I was selected as a mechanic by the Campagnolo Technical Support Team for the International Invitational Track Events held at the 7-11 CSUDH Velodrome in Los Angeles. CA. The 2005: Jelly Belly Pro-Cycling Team Mechanic @ Redlands Stage Race, CA. The 1996: Masters Track National Championships held in San Diego, CA. The 1991: Masters Track National Championships held in San Diego, CA. The 1990: Masters Track National Championships held in San Diego, CA. The Subaru Beverly Hills Invitational Series, CA. The Wheat-Thins Cup Series held in Hollywood, CA. The Manhattan Beach Grand Prix, CA. The Hermosa Beach Grand Prix, CA. Tioga Mountain Bike Team Tension disk wheel mechanic & builder. I have been repairing bicycles and building wheels since 1965, working in many of the South Bay/Los Angeles area local bicycle shops and from my home. I specialize in wheel building, pro bicycle service and building also restoring antique racing bicycles. I also have worked at TRW Defense & Space Systems in Engineering from 1975 until 1988. My mechanical background has a strong working knowledge of Mechanical engineering and also includes Aerospace electronics, Mechanical drawing, Machine shop, Microelectronic Micro-Chip Production, Vacuum System Equipment Maintenance and Repairs, Laboratory Equipment Maintenance and Repairs, Auto Mechanics. I have been racing ABLA-USCF-USA Cycling events since 1970, including Road, Cyclo Cross, and specializing in Track and Criteriums. I have competed in hundreds of events and I hold a CAT 2 license for road and track and now compete in Masters racing. I have been coaching since 1979 and am currently on the Senior coaching staff of the Southbay Wheelmen Bicycle club.